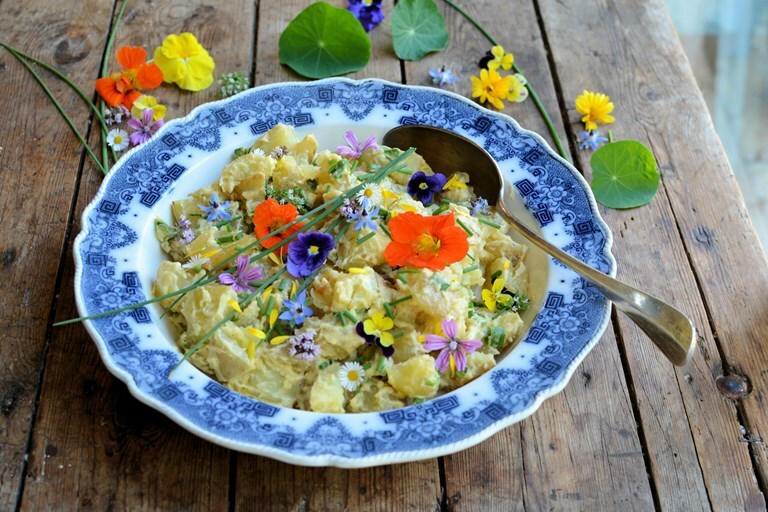 Karen uses freshly foraged edible flowers for her Provençal potato salad recipe, and white truffle oil to make a rich and earthy mayonnaise dressing. Having recently visited Provence in the South of France, I returned home armed with lots of regional produce and ingredients, including some rather special white truffle oil, and more than a few dozen ideas on Provençal recipes. Some of the more inspirational recipes I enjoyed on my trip were the use of edible flowers in lots of dishes in the region. I had them in salads, appetisers and also in baking and cakes. Now I’m already a fan of edible flowers and use them frequently in my cooking, but it’s always nice to come away with new ideas how to serve them. One dish that I enjoyed whilst I was in the Vaucluse region of Provence, was a simple potato salad dressed in a truffle oil mayonnaise and garnished with assorted edible flowers; so, on my return, I decided to have a go at recreating this colourful and extremely tasty salad using a bottle of my newly acquired truffle oil. It’s a very simple recipe to make, but looks simply stunning with its bright and cheerful fresh flower garnish . . . the taste is sublime for all truffle lovers out there, rich and earthy but with a lightness that comes about by adding crème fraîche to the mayonnaise dressing. I’ve shared my recipe for Provençal potato salad below, and I hope that you are all inspired as much I was to go away and make the recipe, which will be perfect for summer dinner parties or picnics!